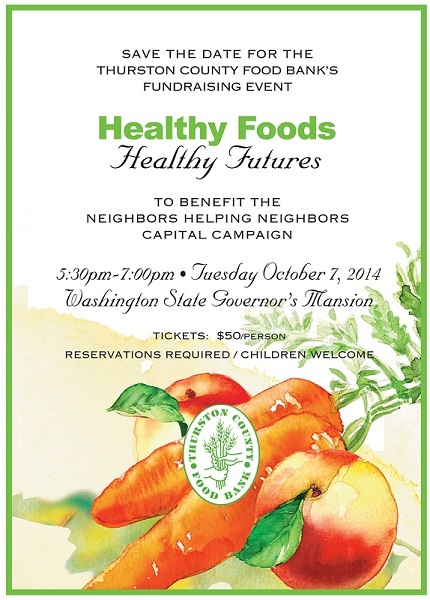 Registration for Healthy Foods, Healthy Futures, is now closed. Thank you for your support! Can’t make it to the event but want to contribute? Click the blue “donate” button and enter HFHF in the designation field. Questions? Call Kelsey at the Food Bank at (360)352-8597. All attendees must be registered by name. Photo ID will be REQUIRED to enter the mansion. Grand Prize = A CSA share (a box of produce per week for 18 weeks during the 2015 growing season) from Helsing Junction Farm!! 5:30 – Guests arrive at the Mansion Gate and check-in with the State Patrol – Adults MUST have photo ID to enter the Mansion. 5:30-6:15 – Enjoy a selection of hot and cold appetizers featuring ingredients made or grown locally, coffee, tea and Lattin’s apple cider. 6:15 – A short program begins in the living room. Children in attendance can join the South Sound Reading Foundation for “Storytime” in the Mansion Library. 6:40 – Head out to take a walk through the Mansion Food Garden. Children in attendance will have the chance to take a group photo with First Lady Trudi Inslee.